Want to see what it looks like from any section in the ballpark? This is the page for you. This feature has been on my site since mid 1999, it’s one of the more unique features I’ve done for this site. Over the years the pictures have been updated a few times, as digital cameras have improved, and enough changes have taken place at the ballpark. The latest update of this page was done on April 2016. You can click on any section in the layout below, and you’ll see a picture of what’s it looks like. For the most part, the pictures were taken in the middle of the specific section – I tried to get an “average” photo. Your precise view will change slightly depending on what row you happen to be in – this is more prevalent in the upper deck, as the upper deck photos were generally taken on Row 7-10 or so (and the highest row is 23). Enjoy, and if you like this feature, or find it useful, please let me know via the comments below. Or you can send me an email. Thanks! Back in 1999, I was looking around the Dallas Stars site and saw that they had a feature where you could click on the seating chart and it would show you what the ice looked like from that section. I thought it was a cool feature, so I looked at the Texas Rangers site, figuring they’d have it (at the time, they were both run by the same Internet firm). The Rangers didn’t – I was surprised by that, so I wrote a couple of people at the Rangers. I offered my time, my equipment, my work (for free, no less), and was told they weren’t interested. OK, fine, I decided I’d do it myself. On Thursday July 22, 1999 I went to the Ballpark early with a digital camera and took pictures in all the sections. I started in Section 3 (the lowest numbered section), and worked my way around section by section. I’d take a picture, move to the next one, take another picture, etc. This progressed until I circled all four levels of the ballpark. It took me about an hour and a half to visit all the sections and get pictures from all of them (including a few minute break between levels ). It was hard work (especially in 100 degree weather), and I was quite tired at the end of it, but I managed to pull it off. At the time, there was 177 sections in the Ballpark. In 2000 it went to 178 with the addition of the Commissioner’s Box, and then in mid 2004 it went back to 177 when Section 201 was removed to put in the “Ameriquest Bell”. Since the original publication of this back in 1999, I’ve updated it a few times. I first updated it in January of 2003 with bigger and better quality photos. On September 28, 2002 I took a much better quality digital camera with me to a game, and retook all of the pictures. When I put this newer group of photos online, I created three different sizes of photos geared towards folks who have larger screen resolutions. The original 1999 photos comprise the smaller edition, and the 2003 update comprises the two larger ones. Also over time, I’ve added several “non seating” areas. Things like the visitor’s bullpen, Green’s Hill and several other hidden surprises. You’ll find them all if you hover your mouse around areas of the seating chart below that do not have any seat section on them. This was updated again in July/August of 2007. The site itself got a major overhaul due to a new version of the blog software used to drive the site. Due to that, I changed the method used to display the images. The images themselves are unchanged since my last overhaul in 2003, but now they’re shown on the same page. The old method had a popup, which meant I had to have a separate page for each version. This new method implemented in the summer of 2007 means I can drop about 600 HTML pages from the site – a nice thing on my end. The update in April 2012 was a complete redo from scratch (several of the previous updates reused bits from older versions). I retook all the photos on April 9th, and coded the new version on April 10th. This time also including the underlying seating chart map. This was mostly necessitated by the total overhaul the Rangers did in Vandergriff Plaza after the 2011 season. The latest update (April 2016) exists given the changes to the park since the last time I took these pics (Apr 2012). That includes the revamping of the visitor’s bullpen, the new structure behind Greene’s Hill, as well as the new scoreboard in left field for 2016. Hopefully this will stick for a few seasons, but if they change enough, I’ll update again as need be. I’ll be bummed when they go to the new park, as I’ll have to redo this all over again. I’ll probably always keep this on the site even when they replace the park, given the amount of work I put into it. FYI – 326U is the upper section of 326. View doesnt really change…just sitting higher up. could you do something to show where the direct sun shines during the game? Is the first base Commissioner’s Box at Ranger’s Park a safe place to sit? I guess that depends on how you define “safe”. It’s definitely a place where you have to PAY ATTENTION, not not be on your phone the whole time, or yeah, you could get hit with something. I wouldn’t call it safe. You could be paying attention, glove ready, and still get hit. But I would definitely sit there. It would be nice if one could know before buying seats in the 119-123 area if you are going to have a pole obstruct your view. We purchased seats for opening day in section 121 row 39 and now I am worried that we will have a pole?! The seats are 1 & 2. Thank you! I don’t think that’s the case. I *THINK* Row 39 in that section is in fromt of the poles, but I don’t remember the row numbers there terribly well. I suggest calling the Rangers ticket office and asking them about it. They can tell you for sure. Trying to get tickets closest to the field! Low row numbers are closer to the field than high row numbers in every section. Specifically, in section 46, row 1 is the front. 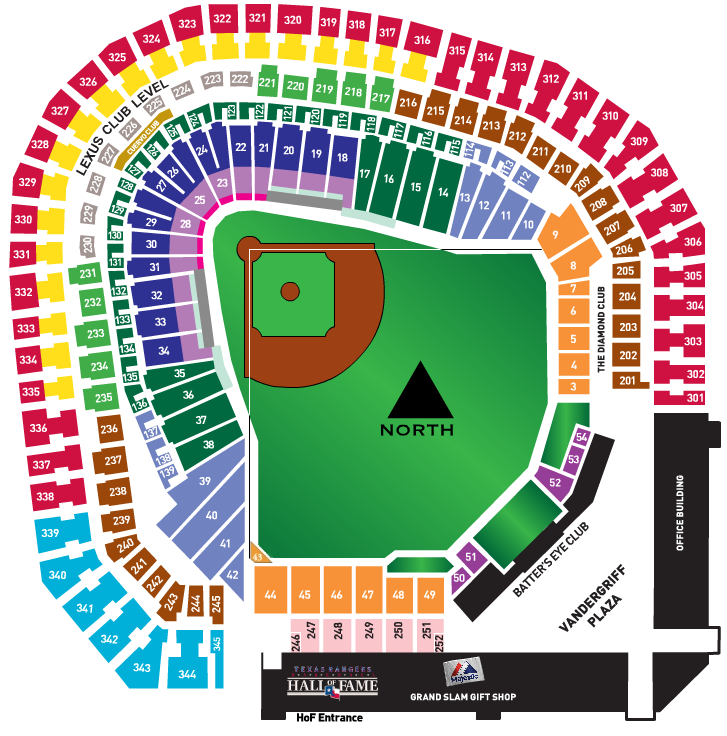 There are a few sections with rows in front of row 1 (commissioner’s box in front of row 1 in sections 16,17,18 and 32,33,34, and also rows A,B and C in front of row 1 of sections 21,22,23,25,28,30,31). Quite a few sections *don’t* start with row 1 but they do start with their lowest umber closest to the field. click on “buy tickets” for one of the listed games, then click on “view seat map” to get listings of individual row and seat numbers. Can you tell me if these seats are under cover: Section 121, row 35, seats 12/13? Everything in the 100 level is under the overhang and therefore in the shade. In section 46, how many seats are there in the front rows? We would love to get aisle seats, but don’t know which number is on the aisle. section 39 seats 1-11 ..are any of these aisle seats..If so which one..? Would need to know what row. this is awesome! thanks man ..section 17 row 24 seats 7,8…..this helped me make my decision on what seats to purchase Rangers should give you something…..I appreciate it…Great Job! I would like to know aisle seating? Section 320 row 20 seat 25.